India ended its league campaign on a winning note with a 4-1 defeat of Chile en route to the final of the World Hockey Olympic qualifying tournament at the Prince of Wales Country Club, here. Fourth seeds Mahesh Bhupathi and Mark Knowles of the Bahamas won their second title in as many weeks with a hardfought 7-5, 7-6 (7) victory over third seeds Martin Damm and Pavel Vizner at the Dubai Tennis Championships. South Africa captain Graeme Smith struck an unbeaten 103 today to guide his team to a nine-wicket victory over Bangladesh in the first one-day international. International Cricket Council (ICC) is investigating Harbhajan Singh’s reported outburst against Matthew Hayden and Adam Gilchrist to nip in the bud any open conflict between the Indian Board and Cricket Australia, a media report has claimed. Kyle Mills ripped the top off England’s batting and Chris Martin took two wickets in an over to bowl England out for 110 and give New Zealand a 189-run victory on the final day of the first Test today. Debutants Ahmedabad Rockets were off to a flying start in the ICL Edelweiss 20s Challenge Twenty20 tournament here tonight. Dishing out a thorough clinical display, Damien Martyn-led Rockets edged past Chandigarh Lions in the opening match of the third edition of the tournament at the Tau Devi Lal stadium at Panchkula. By providing two venues — Panchkula and Gurgaon — for holding the third edition of Indian Cricket League (ICL), Haryana has become an integral part of the league. Controversial fast bowler Shoaib Akhtar appears to be in deep trouble as the Pakistan Cricket Board has submitted a strong chargesheet against him, while coach Geoff Lawson has asked the PCB not to consider the maverick speedster for Test matches. India’s Arjun Atwal won the $2 million Malaysian Open for the second time on Sunday after beating defending champion Peter Hedblom on the second play-off hole at the Kota Permai Gold Club. Lucknow pro Sanjay Kumar, who sizzled with a 12 under par 60 on the opening day, added a four under par 68 to his overnight score to clinch the 13th edition of the BT Honda Pro-Am of Champions on the par-72 Classic Golf Resort in Gurgaon here today. Serena Williams quelled the challenge of Patty Schnyder 7-5, 6-3 to win her first singles title of the season by emerging winner in the final of the Canara Bank WTA Bangalore Open tennis championship here today. International shooter Avneet Kaur Sidhu has won a gold medal in the women’s individual 10m Air Rifle event of the Australia Cup Shooting Championship held at Sydney International Shooting Centre (SISC), in Sydney today. With their berth in the tomorrow’s final already confirmed following Britain’s 4-0 win against Austria, the Indians played freely and with confidence, but missed far too many scoring opportunities in the match played late yesterday. The winner of the final will qualify for the 2008 Beijing Olympics. Drag-flick specialist V. Ramachandra Raghunath was again in the thick of things scoring two goals (23rd minute, 61st), including one from India’s only penalty corner to take his tournament tally to 10. Prabhjot Singh (9th) and Bharat Chhikara (23rd) scored one apiece. For Chile, which defended with great fortitude, Felipe Montegu converted their lone penalty corner in the 63rd minute much to the delight of the partisan crowd. India thus finished second overall behind Britain with 12 points, followed by Austria (9), Russia (6), Chile (3) and Mexico (0). Although dominating much of the game, the Indian forward line yet again missed out on far too many scoring opportunities even granting that the Chilean defenders were on the button with their marking and covering. The Indians rested Gurbaj Singh and Shivendra Singh for the game and the reshuffled half-line was quite solid overall despite a few blemishes. On their part, Chile played well as they were allowed to and their limitations denied them more success. India took time to get into their stride despite taking the lead in the ninth minute when Prabhjot deflected home a Bimal Lakra long corner hit. Only in patches did the Indians display fluency and rhythm against a team that was running on enthusiasm and precious little else. The Chileans did put together a few moves, but it called for a little more skill and finesse to breach the Indian defence that otherwise led a quiet existence through much of the first-half. Past the 23rd minute, Raghunath found the boards off a Prabhjot Singh pass to give India a 2-0 lead that galvanized the side into more action. Then followed probably the best phase of Indian display in this session when a flowing move down the middle orchestrated by Ignace Tirkey and Tushar Khandekar finally saw Chhikara letting fly from the right for the third goal. Despite the obvious dominance, the Indians looked nowhere near their best or the form they showed while demolishing Austria or Mexico earlier in the league. India began the second-half on a strong note, stringing together a few fluent moves while stepping up the pace. Adopting a "full-court press", they kept Chile under pressure, but a goal eluded them. Rajpal had the best of chances in the first 10 minutes of the half when he launched a lightning counter-attack, exchanging passes with Prabhjot. However, on entering the circle, Rajpal shot wide. Rajpal had another great opportunity to score. Put through by Roshan Minz, he was way off the mark in the 53rd minute. Almost immediately, it was Prabhjot's turn to muff a sitter by shooting straight at the goalkeeper. Intent on attack, the Indians left their back open and Chile counter-attacked. However, an alert William Xalco intercepted inside the circle and sent Prabhjot on his way. Defender Ian Koppenberger, in desperation, brought down Prabhjot near the centre-line and was sent off with a yellow card in the 54th minute. Three minutes later, India received their third yellow card in two matches when Ajitesh Roy was given marching orders in the 57th minute for bringing down Cristobal Rodriguez. The Chilean defence stood up well to the onslaughts, soaking in all the pressure, but a deliberate foul inside their own 25-yard area presented India a penalty corner in the 61st minute and Raghunath converted for the fourth goal. Chile went on the attack, but Prabhodh Tirkey came up with a great tackle. However, the Indian skipper dilly-dallied rather than clearing the ball and the hosts went on to force a penalty corner. Montegu sounded the boards with a carpet shot to trigger celebrations in the packed stands. Chile's fightback came rather too late in the day as the Indians withstood an avalanche of attacks to come through without further damage. Playing at half-pace, Britain beat Austria to complete their league engagements with an unbeaten record and 15 points in the World Hockey Olympic qualifying tournament, here. Britain's win yesterday only confirmed India's progress to the final as Austria finished on nine points. Leading 3-0 at half-time, Britain scored through James Tindall (5th minute), Ashley Jackson (12th), Richard Mantell (22nd) and Rob Moore (69th). It was a sweet win for Bhupathi yesterday who had just launched a Tennis Academy in Dubai this week which received an enthusiastic response from youngsters here. 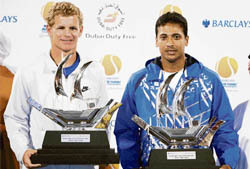 Bhupathi won the Dubai title in 1998 and 2004, while Knowles previously triumphed here in 2002. Fresh from their Memphis win last weekend, Bhupathi and Knowles just about managed to keep the edge over the opponents in the closely fought match, as both pairs were chasing their second ATP title of the season. Damm and Vizner had won last month in Marseille. In the 11th game, it was the Czechs who first had the chance to break Knowles’ serve. But Knowles held and then broke on Vizner’s serve to win the set 7-5 in 42 minutes. The tie break in the second set saw some tense moments but Bhupathi and Knowles held their own and took the set 9-7. Bhupathi and Knowles have won their last eight matches in straight sets, and this was the 49th doubles title for Knowles, while Bhupathi picked up his 43rd career crown. “At the moment, we are just trying to win as many matches as possible. We have not really been able to keep a tab on how many sets we have won so far,” Knowles said. Smith's opening partner Herschelle Gibbs scored 57 in South Africa's 180 for one from 36.5 overs in reply to Bangladesh's 178 all from 48.2 overs. The pair put on 143 for the first wicket. Smith faced 118 balls and hit one six and 14 boundaries. Gibbs hit a six and eight fours from 84 balls. Opener Tamim Iqbal was the only successful batsman for Bangladesh, striking 82, his fourth one-day half-century. Iqbal faced 98 balls, hitting a six and nine boundaries. “We were set up by our bowlers. I think we were very clinical and brilliant in the field,” Smith told reporters. According to ‘The Australian’, match referees Mike Procter and Jeff Crowe have asked India to reign in Harbhajan. “We are aware of Harbhajan Singh’s comments and are in dialogue with the two boards (Australia and India),” the newspaper quoted an ICC spokesman as saying. Harbhajan could be charged with unbecoming conduct, which carries penalties, including suspension, the report added. SYDNEY: Cricket Australia (CA) have lodged a formal complaint with the Indian cricket board over comments made by Harbhajan Singh about Matthew Hayden and Adam Gilchrist. CA chief executive James Sutherland asked the Indian board to take action against Harbhajan after he called Hayden “a big liar” and said Gilchrist was “no saint”. “Enough is enough,” Sutherland wrote in a letter to the board, published in Sydney’s Sun Herald newspaper. The Indian board said it had instructed Harbhajan not to comment on the controversies which marred the tour Down Under. “We have told Harbhajan that there should be no more such comments,” board secretary Niranjan Shah told Reuters today. Mills took four wickets before lunch to destroy England’s possible run chase for 300 to achieve victory, while Martin bowled Tim Ambrose and had Ryan Sidebottom caught behind by Brendon McCullum in one over after lunch to end their hopes. Ian Bell top-scored for England with 54 not out while Mills finished with figures of four for 16 off 13 overs and Martin had three for 33 off 13 overs. Debutants Ahmedabad Rockets were off to a flying start in the ICL Edelweiss 20s Challenge Twenty20 tournament here tonight. Dishing out a thorough clinical display, Damien Martyn-led Rockets edged past Chandigarh Lions in the opening match of the third edition of the tournament at the Tau Devi Lal stadium at Panchkula. Batting first, Wavell Hinds and Sachin Dholpure gave the Rockets a dream start. Their seamers then returned to bowl in a brilliant fashion. Choking the flow of runs in the death overs, they enabled Rockets to coast home by a comfortable 19-run margin. Needing 159 runs to win from the allotted 20 overs, Lions never really managed to pose a challenge. Their top order batsman, except for opener Mathew Elliot to some extent, failed to contribute much. It was the 54-run stand for the second wicket between Elliot and T P Singh, that kept them in the hunt after the early fall of Lou Vincent. After this stand was broken, they lost some crucial wickets in a heap which put them in a spot of bother. After the completion of 16 overs, Lions needed 47 runs. But Jason Gillespie and Heath Streak proved tough to get away. Local lad Dinesh Mongia holed out at the long-off fence after scoring run-a-ball 16 off Heath Streak. All rounder Reetinder Sodhi, who opted to play for Ahmedabad instead of Chandigarh Lions, returned to bowl a superb 18th over, virtually giving away nothing and castling Munish Sharma. Munish attempted an ambitious lofted stroke only to have his stumps shattered. With the asking rate climbing, Rakesh Patel kept his nerve and conceded eight runs in the 19th over to put the task beyond the Lions. Though Sarabjit Singh tried to his best and clobbered a four and a lusty six off successive deliveries in the last over, the efforts proved to be in vain as Rockets were home by 19 runs. Earlier, Wavell Hinds and Dholpure gave Rockets an impressive start. Both were in supreme nick. Dholpure matched his more illustrious and experienced partner stroke for stroke. Hinds mostly dealt in sixes, while Dholpure was also not found wanting either. Hinds clobbered five in all and struck three fours in his 43-ball 59, while Dholpure was equally enterprising notching up almost identical 43-ball 54 studded with three sixes and four fours as both were involved in 122-run opening-wicket stand. But introduction of Mongia and Chris Cairns into the attack put brakes on the scoring. Mongia struck twice sending back Dholpure and skipper Martyn while Cairns consumed Murrey Goodwin and S. Sriram to peg Rockets to 158. The last six overs produced just 36 runs. Mongia was the best bowler from the side finishing his four overs conceding 18 runs with two scalps. For his whirlwind knock, Wavell Hinds was adjudged Player of the Match. But the startling fact is that in the league, which has roped in 137 cricketers including 51 foreign players, there is not even a single player of the state playing in the league. It is not that the players of the state do not want to join the BCCI’s rebel league but the hard fact is that no Haryana player could attract the attention of Zee group officials with his game, said sources on the condition of anonymity. Not in ICL only, even in BCCI’s own Indian Premier League (IPL), starting from April 18, only one player of Haryana Joginder Sharma, who shot into the limelight after the first Twenty20 World Cup held at South Africa last September, could make it to the IPL. The Chennai team has signed Sharma up for the forthcoming league. “No IPL franchisee even asked for a list from Haryana Cricket Association”, added sources. “Except one or two players, the state has not any other player which could be termed as up to the mark. The state team was tottering in the Plate group this session of Ranji Trophy where it had lost in the semifinals. In the North Zone team of Deodhar trophy, only Amit Mishra from the state could secure a berth while the other two — Sunny Singh and Sanjay Budhwar — are in standby list. “The cricketing standard has declined drastically in the state,” said Rakesh Jolly, former Haryana Ranji player. “The simple reason is Punjab has better development programmes as well as infrastructure to offer the cricketers”. When contacted Haryana Cricket Association’s general secretary Ranbir Singh Mahindra said that it is due to BCCI politics that our cricketers suffered in IPL. On the ICL, he declined to comment. In a chargesheet submitted to the disciplinary committee hearing the case against Shoaib, the PCB has described the bowler as a lawbreaker in the game. According to sources, the PCB has written that Shoaib has a record of breaching the terms of his central contract and he has remained in the spotlight for wrong reasons. To make matters worse for Shoaib, Lawson has also suggested that the express bowler be selected only for the ODIs as he was not reliable for Test cricket. "His future may lie in just being a ODI bowler as his lack of reliability is not good for Test match cricket," Lawson wrote. The disciplinary committee met yesterday to go through the chargesheet submitted against the fast bowler, who is under a one year probation after being banned for 13 matches and fined Rs 3.4 million for having a brawl with teammate Muhammad Asif in South Africa last year. Now, the board has charged Shoaib with giving media statements against the policies of the PCB after he was dropped from the new central contracts list in January. Shoaib accused the board of having double standards while dealing with the players and accused it of conducting 'B' grade matches at domestic level. Shoaib, in his response to the PCB notice, has written rather passively to Board Chairman Dr Nasim Ashraf. Atwal, the 2003 champion, surged up the leaderboard with a final round of eight-under-par 64 to finish on 18-under 270 for the tournament. Overnight leader Hedblom missed a chance to win outright when his birdie putt on the 18th hung on the lip. He settled for a one-under 71. Atwal, 34, needed only a par at the par-three second extra hole to win the first prize of $340,000 while his rival three-putted. "I didn't think I had a chance starting out and just relaxed from the first hole. It was only on the 11th I felt I had a chance. It is incredible." The Malaysian Open is co-sanctioned by the European Tour and the Asian Tour. The stocky pro had a two-day total of 16 under par 128 and walked away with the winner's cheque of Rs 1,20,000 along with the Rs 55,000 he pocketed for returning the best card on the opening day. Ashok Kumar struck fiery form today to play a nine-under par 63. But this late charge fell one stroke short of the champion as he finished with a 36-hole total of 129 after having opened his account with a 66 yesterday. Digvijay Singh ended up third with a total of 132 while Rahul Ganpathy and Sujjan Singh were tied for the fourth place at 133. Ashok not only bagged the cash prize of Rs 55,000 for returning the day's best card, but also ended up with a cheque of Rs 80,000 for being the overall runner-up. The day’s second best card was submitted by Digvijay Sngh who shot a 65, which made him richer by Rs 35,000. In an exciting format where the team is decided on a random draw, professional Naman Dawar led his amateurs — former cricketer Nikhil Chopra, Deepak Talwar and Vijay Dhawan — to victory with a total of 124 stableford points. With her booming serves and variety of strokes, Serena pocketed the title as well as winner's prize of $95,500 and 300 ranking points. Serena put pressure on her Swiss opponent as she fired two aces and made Schnyder work hard to save a game point for a 1-1 scoreline. Then on, it went on serves. Schnyder was also never relenting in her counter attacks and hit some stunning forehand returns. This forced the American player to try a little hard, which resulted in many unforced errors, specially in the first four games. Serena required just one break to wrap up the first set which she got in the 12th. A product of Dashmesh Girls College at Badal village, Sidhu has also earned herself a berth for the Beijing Olympics.